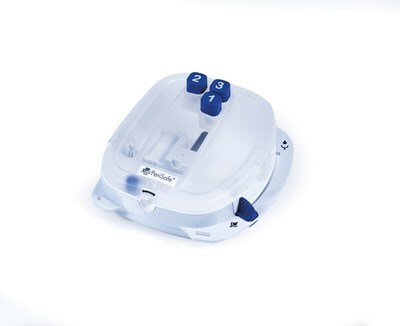 ZURICH, March 27, 2019 /PRNewswire/ -- The Swiss medtech startup Peripal AG introduces an innovative auxiliary device for peritoneal dialysis patients. After successfully developing the device in collaboration with ETH Zurich, Peripal AG received the seal of approval to introduce it on the European market. Now patients can undergo home dialysis treatments both more safely and more easily. Measured against the number of patients, the healthcare costs for patients with renal insufficiency are disproportionately high at an average of 2-3% of the overall healthcare costs, which amounts to 3 billion euros annually in Germany alone. The number of chronically ill kidney patients will continue to increase markedly in the coming years. In order to counteract skyrocketing costs, the healthcare industry must focus increasingly on at-home therapies, which are significantly more cost-efficient than hospital dialysis treatments. It is a known fact that the majority of all patients and their family members would prefer therapy in the comfort of their own homes, thereby increasing their quality of life. The risk of infection, increasing age, and the associated limitations, however, are some of the reasons why ultimately very few patients choose to perform home dialysis. This is where the Zurich-based company Peripal AG comes in. "We developed the device in close collaboration with dialysis patients, so logically it is geared toward the needs of the people who actually use it. The whole team is really proud of this", says CEO Dr. Sandra Neumann. PeriSafe®, which can be used on peritoneal dialysis patients starting immediately, prevents infections and substantially simplifies the therapy process. As a result, patients who were not yet eligible for treatment also have the chance to undergo peritoneal dialysis. Today approximately 10% of all patients worldwide perform dialysis at home, though experts and scientific studies conclude that the potential number of such patients may be as high as 35%. The new device is an important step in promoting home dialysis, a process which has long been demanded and supported by health departments and health insurance companies in numerous countries. Peripal AG is a privately-financed startup of ETH Zurich in the medtech industry founded in 2015. Peripal is a medtech company that develops devices and solutions that allow more patients worldwide to undergo treatment at home. The company's first product, PeriSafe®, enables chronically ill kidney patients to undergo dialysis treatment at home, contributing to the decrease of the patients' healthcare costs.